Copyright © Akira Yoshida 2005-2019. All rights reserved. I made it at my own choise and then the file got very large. 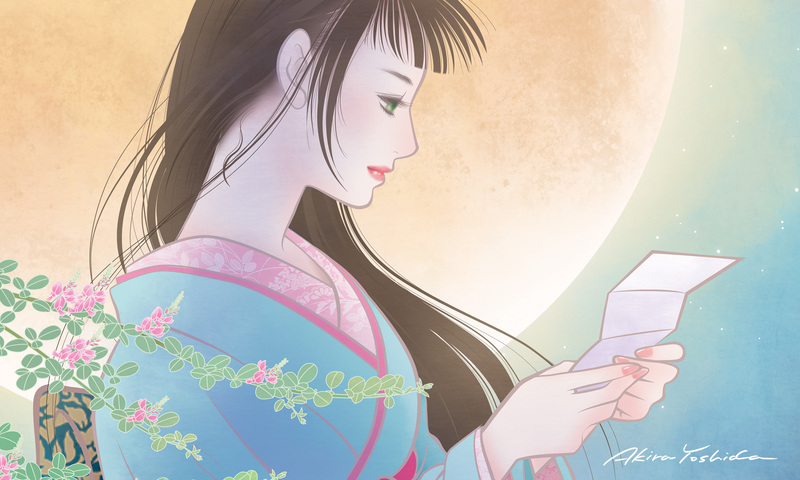 This story might be said to be close to the world of the “Tales of Moonlight and Rain” or “The Tales of Ise”. It’s a Japanese-style love story. Apr, 2005 Completion of the scenario. Feb, 2006 Ms. Kodama lettered the title with calligraphic characters. Feb, 2006 Completion of the version without voices. The music was bought from Nash Studio. Mar, 2006 Request of voice actors coordination to Ms.Kawazuma of TEAM_Radio*Actress. Mar, 2006 Completion of 17min 06sec version. Apr, 2006 Completion of 15min. version. Released on the Web. May, 2006 The 17min 06sec version won the fine art award at the 18th DoGA CG animation contest and went on the screen. May, 2006 The 17min 06sec version was included on the DVD of the collection of the selected works at the 18th DoGA CG animation contest. July, 2006 The 15 min version was accepted as a nominated work at TBS DIGICON6+2 . Oct, 2006 It won the excellent award at the 2nd Kichijoji animation film festival. Jan, 2007 It won the director Nakano award at the TSS short movie festival. July, 2007 It was accepted as a nominated work at BroadStar Award 2007. Mar, 2007 The English subtitled verison was released. I really appreciate all of those who worked with me! Thank you! >> Production diary blog is here. Copyright © Akira Yoshida 2019.All rights reserved. Reproduction without permission of any image data in this site is forbidden.